A trip home conjures memories of a small-town skiing vibe and carving turns with heavyweight IQs. Above: There&apos;s room to spread out on the beginners&apos; hill at Pajarito Mountain Ski Area. Photography by Stephen Shankland. MY HEART BURSTS WITH JOY AS I follow a gangly 11-year-old boy down an easy run at the Pajarito Mountain Ski Area. A few moments ago, that boy—my son Levi—made the momentous advance from beginner snowplowing to the parallel turns that let you get the most out of the slopes. A generation earlier, my own dad had taught me to ski on these very slopes at Los Alamos’ hometown ski area. Not only had we devoted countless weekends to what may well be the smartest ski hill in America, but we’d joined its ski patrol together and spent years helping other skiers stay safe. Skiing with my own son brings me full circle. I was just a skinny 15-year-old when I signed up for the Junior Ski Patrol in 1983. Even then it boasted plenty of super-intense scientists. My dad was one of them, studying the electrical properties of rocks deep in the earth’s interior. A classmate who joined the patrol the same year I did is now a plutonium chemist. Bill Purtymun, Pajarito Mountain’s current assistant ski patrol director, spends his non-powder days planning for lab emergencies like the release of controlled chemical, biological, or radioactive materials. During one of Los Alamos’ recent wildfires, he helped firefighters wrap their heads around the fact that the lab has bunkers filled with high explosives. “This patrol probably has more PhDs than any other ski area in the world,” says Denny Hjeresen, a Pajarito patroller who manages radioactive waste matters for the lab and advises Estonia and Ukraine on the issue. Thanks to my time with people like them, I did a lot of growing up at Pajarito Mountain. Two decades after I moved from Los Alamos to California, I still dream every week or two about skiing there. Evidently, part of my subconscious is anchored to the Jémez Mountains, which rise 3,000 feet above downtown Los Alamos. From the day my dad first took me down its slopes, in 1975, to last year’s return trip, the ski area has been part of my DNA. And, I was happy to discover, it still carries a hometown vibe. LOS ALAMOS IS a funny place. It’s a company town, dominated by Los Alamos National Laboratory and the thousands of researchers who work there. In the county, 39 percent hold postgraduate or professional degrees, versus just 11 percent for the country overall, according to U.S. census figures. You can’t avoid the science. Driving up to the ski hill from Santa Fe, you have the choice of the Main Hill Road, blasted into rock during the Manhattan Project to build the world’s first atomic bomb, or the Truck Route, which passes a particle accelerator that generates intense beams of neutrons for research projects. J. Robert Oppenheimer picked it in 1943 for a place to create that early weapon. In more recent decades, the lab has diversified into many other areas, but nuclear weapons remain core to its mission, and it’s hard not to notice. As a kid, driving up Pajarito Road to the ski area, we’d first pass Technical Area 18 in Pajarito Canyon, where a dangerous postwar experiment called “tickling the dragon’s tail” studied the nuclear fission chain reaction that powers an atomic explosion. Atop the mesa a few minutes later, we’d pass Technical Area 55 and the heavily fenced Plutonium Facility, where researchers manufacture the core elements of nuclear weapon prototypes. The lab closed that road to the public after the 9/11 terrorist attacks, so don’t expect to retrace the route I took most winter weekends. Even on the publicly accessible road to Pajarito Mountain, a guard will check your ID before you drive near LANL headquarters. The ski area itself owes its existence to the scientists. The town’s first ski run was cut during World War II by George Kistiakowsky, the leader of the lab team that perfected high-explosive “lens” technology. The approach created shock waves to precisely compress the plutonium sphere at the heart of the Fat Man atomic bomb. In the mountains above Los Alamos, Kistiakowsky turned that skill to forestry, cutting down trees with explosive charges. Above: The Pajarito Ski Patrol. Photography by Minesh Bacrania. Pajarito Mountain has changed a lot since then. The rope tow on the beginners’ hill and the T-bar on Aspen were upgraded to chairlifts, and a new lodge brought a better café and flush toilets. The Townsight lift opened up more terrain on the east side. Snowmaking machines help when nature falls short. And it’s now operated by the Sipapu Ski and Summer Resort company. 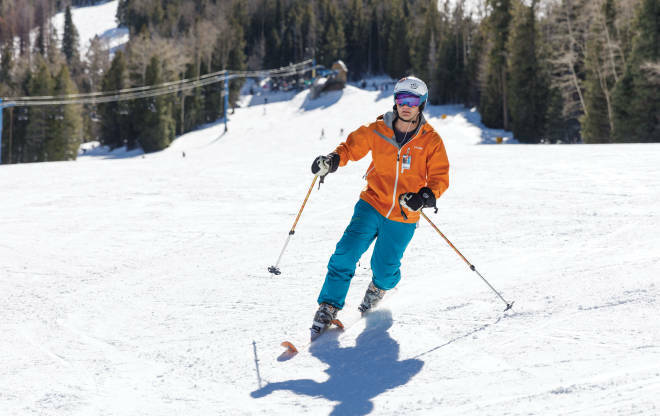 But the days of the all-volunteer Los Alamos Ski Club are far from over. DAD RECOMMENDED that I join the Pajarito Mountain Ski Patrol. It was one of the best things we did as father and son. We spent weeks in first-aid training, every Tuesday and Thursday from 7 to 10 p.m. We learned how to handle an emergency childbirth and apply traction for a broken femur, though it was rare to find any conditions that serious among skiers. We used Jaws of Life hydraulic extrication tools to pry one another out of smashed cars provided by a local auto repair shop. Most memorable was the final test, when we had to treat a victim of a simulated chain saw accident who’d been drenched in very real horse blood. Then there was the training on the slopes. I’m a good skier, but I struggled to manhandle an orange fiberglass toboggan loaded with a fellow patroller posing as an accident victim. It wasn’t bad on the smooth slopes, but threading between the moguls of the steepest runs or grunting through deep powder wasn’t easy for a ninth grader. We also learned to evacuate the chairlifts—easier than you’d think, once you got the rescue rope over the chairlift cable. Learning was nothing new to me, but learning next to my dad was altogether different. As I watched him scrawl notes, I realized we had become peers. And we were members of a team, too. It’s harder to be a flippant teenager when you’re both kneeling on the floor, practicing chest compressions and rescue breathing with a Resusci Anne CPR mannequin. Soon, the real patrolling began. On duty days, we’d arrive early to make sure lifts and runs were safe, take our shifts on the patrol room radio, and sweep the rapidly chilling mountain for stragglers after the lifts closed at 4 p.m. We had trained for emergencies and trauma, but that kind of excitement was rare. Mostly I just kept on skiing with my friends and family. But now I had a big yellow cross on my jacket that said NATIONAL SKI PATROL. I took every day in uniform seriously. My most worrisome time came when an out-of-town skier failed to return his rental skis at the end of the day. We headed up the lifts for a second sweep of the mountain. Daylight dimmed, and the air chilled. We called and called for him, looking closely at every patch of forest. We found some tracks headed past the ski area boundary, and I felt deep relief when the Los Alamos Police Department retrieved the man far down the back side of the mountain. Some people were baffled why we did it. We had to buy our own uniforms and equipment. We didn’t even get free lift tickets. The closest thing to getting paid was snarfing free hamburgers if the café had any left unsold at the end of the day. A fellow student mocked me with the nickname “Cub Scout” for all of ninth grade after finding out about my do-gooder training. “I had friends who were bugging me for years,” says Wendy Akerley, a laboratory scientist at Los Alamos Medical Center who serves on the patrol today. I chat with her and Purtymun in the cozy warmth of Aspen House, the ski patrol building at the top of the longest lift. I spent many hours on duty here in the 1980s and ’90s. It’s got the same sunny, relaxed vibe it did back then—and also the same sense of alertness. You don’t take off your chest radio, your first-aid fanny pack is one buckle snap away, and you can reach most of the mountain in a few minutes if someone calls in an emergency. For all the teasing we endured, there’s something to be said for being part of a team of people that exists just to help others out. “There’s a lot of community service here in Los Alamos,” Purtymun says. THESE DAYS, the patrol has 65 volunteers and, in a change from my years on the patrol, 11 paid patrollers, too. That supports the ski area’s ability to open on Thursdays and Fridays, when most of the volunteers are at their regular jobs, not just Wednesdays and weekends. The patrol still welcomes young adults, too, and about five join each year. “They’re hungry for more responsibility,” Purtymun says. “They want to do lift evacuations. They’re eager to get their skills up.” I can relate. Earlier in human history, kids could be productive milking cows, harvesting crops, minding the store, mending clothes. But today, many won’t finish training for their careers until well into their twenties. 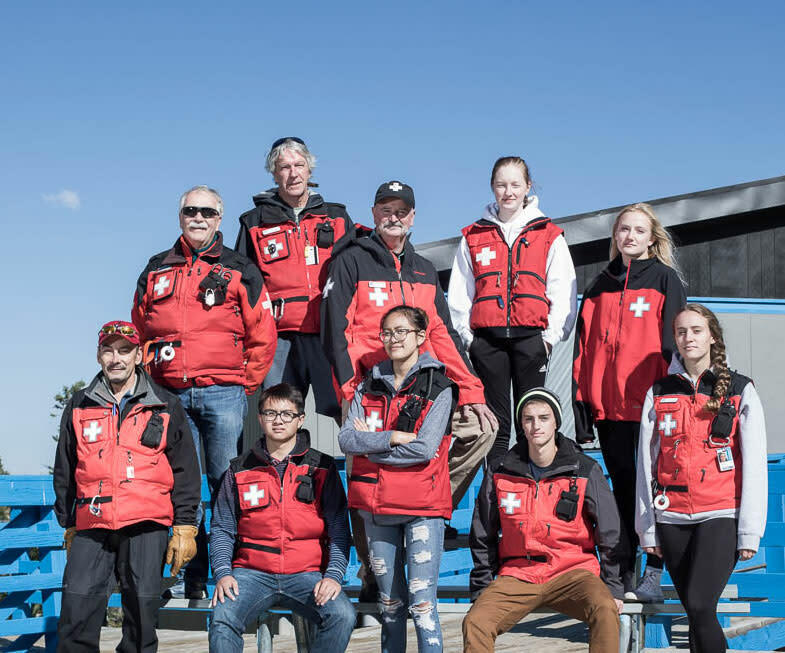 The Ski Patrol gives them a chance to shoulder adult burdens. My own momentum conjures vivid memories of Pajarito Mountain. My first season, using wooden skis and leather boots my dad had bought at the annual Ski Swap, ended abruptly when I smashed into his boot while skiing down Bonanza, the easiest run on the east side. My ski tip snapped off, which meant I got to upgrade to a pair of Rossignol Smash J skis, my pride and joy. The Smash Js were aptly named. I had them on during one early attempt to navigate the moguls of an expert run, Little Mother. I hadn’t yet figured out how to ski among the big bumps, and my goggles had iced up from a snowstorm, so I lurched across the slope until I smacked into a tree. No harm done, but 40 years later I can still find that tree while looking down from the Mother Lift. Those Smash Js also carried me to a super-narrow slope on the far west side called Ma Bell, once the route for a phone line across the mountain. It’s tough to get in your turns: You’re squeezed tightly between the trees, and the run descends diagonally instead of following the fall line straight down. At the halfway point, a seven-foot cliff drops over a boulder. A more conventional run nearby later appropriated its name, but that skinny slot through the forest will always be the true Ma Bell for me. In later years, my friends and I checked out every corner of Pajarito Mountain. We knew the best glades for powder skiing once new snow on the main runs got chopped up. We found the fence line that lets you sneak east to west across much of the mountain. We knew the traverse from the Mother Lift, around the back side of the mountain, with views of the Sandía Mountains all the way down in Albuquerque. As a boy, I didn’t realize how charmed a life I led, with a ski area a half-hour drive from home. As an adult living in the San Francisco Bay Area, where the Sierra Nevada slopes are hours away and lift prices make your eyes water, I know better now. That’s why, last year, I was so keen to take Levi to Pajarito Mountain during a visit with my parents. As we ran the slopes, the memories flooded back. In May 1985, after my friend Bill Carter and I took our SATs, we hiked up the broad Aspen slope to get in one last post-season run. When Levi and I descended I Don’t Care, looking out over the beautiful Valles Caldera, I recalled how I’d bombed down the same run on a late-spring day with Bill, lofting over the biggest melted-out patches of grass and rock I could manage. I even showed Levi the tree I’d smacked into so embarrassingly. Best of all, I remembered the day when my father told me I’d become the better skier. As a parent, I can attest that seeing your child succeed is a marvelous thing. While Levi hasn’t passed me yet as a skier, that day at Pajarito he took a big step in that direction. He’s a smart kid. He’s on his way. Open Wednesday to Sunday from late November to early April. Also open during Christmas break and any Monday that’s a federal holiday. Special events include craft beers and live music; Telebration, a weekend for telemark skiers; and Skiesta, an all-mountain party with races like the Sloppy Slalom and Mogul Mash, plus the Pinhead Challenge for telemark skiers.